The Strategic Computing Complex (SCC) is a 300,000 square foot facility built specifically to house world class super computers and a nuclear weapons design staff. The facility design staff had to carefully consider and balance safety, security, efficiency, life cycle costs, working conditions, and the need for flexibility to address changing computing technology. The project went through the planning phases from late 1997 through 1999. The design/build contract was signed in October 1999 and the building was completed in December 2001. The facility was constructed near the core of the Los Alamos National Laboratory on an existing parking lot. The mission assigned to the SCC required careful consideration of the significant aspects identified. The stated goal was for this facility to facilitate and support the design and testing of nuclear weapons through the use of super computers. This involves melding high technology with a range of scientists and computer specialists. Supporting a team approach to work through building design was a focal point for the design team. Accessible Goal: The accessibility goal was to comply with all Federal requirements, taking no exceptions due to the stringent security requirements that often conflict or make compliance difficult. Aesthetic Goal: The aesthetic goal was tied to future staff recruitment. We wanted a facility that would generate excitement and anticipation in our new staff recruits. Cost-Effective Goal: Overall cost effectiveness was a major point of focus for this project. Given a budget ceiling from the DOE, the cost objective was to maximize the number of office spaces that could be provided once the computer floor was "paid for." Functional Goal: The office space were grouped to support a team environment with central break areas to encourage walking the hallways and interfacing with peers. Productive Goal: The productive goal was to create an environment that actively supported teaming and communication by a broad spectrum of specialty scientists. Secure/Safe Goal: The security requirements were extensive and were constantly presenting new challenges relative to the other goals and needs of the facility. In the end, the facility was successful in preparing a world class facility to construct, test, and operate super computers under an extremely secure environment. Sustainable Goal: Environmental concerns regarding the power and water use necessitated by the super computers were thoroughly evaluated and considered. Use of recycled water to cool the computers (and the whole building) resulted in this building having no net increase impact to water use at the Los Alamos National Laboratory. Environmental aspects were also included to limit power consumption, use of daylight, and use of recycled material. All of this had to be accomplished while maintaining separate power distribution systems for classified and unclassified electronic gear and communications equipment. 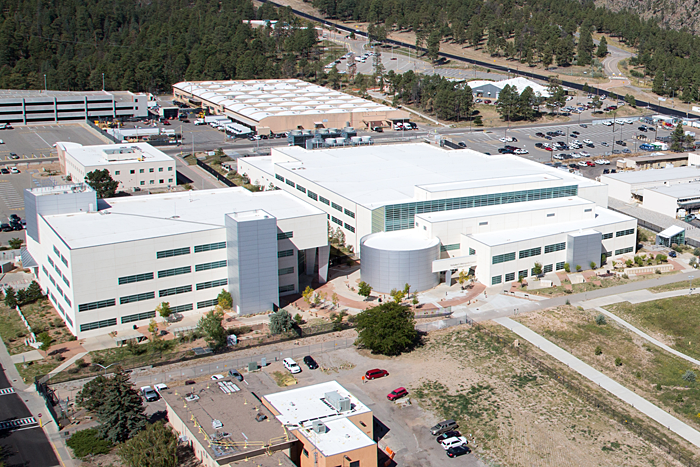 Other Significant Aspects Of The Project: Security requirements were significant given the primary mission of the Los Alamos National Laboratory and this specific building. The most intensive effort was during the pre-design/planning phase of the project to ensure proper integration and balance between all aspects of the facility. During this phase a cross-functional team was assembled to develop a conceptual design of the facility. Weekly meetings between this team and the architects/engineers allowed for all aspects of the design to be discussed in front of all interested parties. Safety, security, and the ultimate users were participants in all meetings. At the completion of this effort, the team assembled the key points that they learned through the conceptual design process into functional and operational requirements (F&ORs) by room type. The F&ORs were then used as the core portion of the request for proposal (procurement) process to result in a design/build contract. Once the contract was signed, the design, construction, turn-over, and operations began with the F&ORs providing the roadmap and inspection requirements to assure ultimate compliance. Design Activities: During the design phase, the integrated team continued to review the design as it progressed for conflicting requirements and opportunities for improvement. Construction Activities: Construction activities also were overseen by the integrated team. Daily site tours were utilized to ensure that the answers developed during the design phase were actual solutions to the problem statements. Operations/Maintenance Activities: Formal turnover of the facility from construction to operations and maintenance included the entire team to fully convey the design intent to the occupants. Materials were deliberately selected based on many of the characteristics identified in this topic. Recycled and recyclable material was frequently chosen over other products and life-cycle cost evaluations were utilized to assist in the selection of other materials. Energy efficiency was a large concern for the design team since the computers already had such a large demand identified (7MW). Therefore, energy efficient lighting and heating were used throughout the building. Motion sensors were also used in the offices to control lighting. Indoor issues required the balancing of safety, security, teaming, and operating efficiency. Security was ultimately resolved by building the entire facility to comply with vault-type room standards to support efficient teaming among the staff while still protecting the classified data. The electrical and data distribution system also had a number of unique features to support the security requirements. These issues were dealt with one-by-one within the integrated project team until solutions that properly balanced the needs and met the requirements were identified. The building exceeded everyone's expectations in all the categories identified in this topic. The project was completed ahead of schedule and 15% under budget. The users have found the building very friendly and supportive of their working requirements. The environmental aspects are all operating as intended. All-in-all, the method used to develop the F&OR's and the design/build contracting methodology combined wonderfully to complete this project.